Defcon keeps announcing more and more interesting events for next week’s conference. A free workshop is planned for the soon to be released DAVIX live CD. DAVIX is a collection of tools for data analysis and visualization. They’ll be running through a few example packet dumps to demonstrate how the tools can help you make sense of it all. [Thomas Wilhelm] will be driving out from Colorado Springs in his Mobile Hacker Space. He’s giving a talk Sunday, but will be giving presentations a few hours every day at the van. Some researchers from NIST will be setting up a four node quantum network and demonstrating some of the possible vulnerabilities in the system. Finally, as part of an EFF fundraiser, Defcon will feature a Firearms Training Simulator. Conference attendees will participate in drills designed to improve their speed, accuracy, and decision making skills. 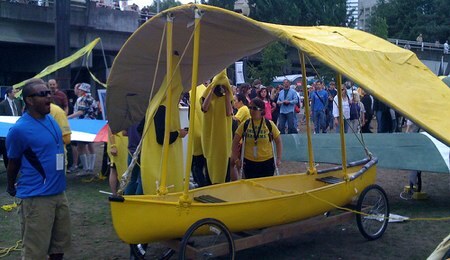 Off all the competitions for poorly performing human powered flying machines, the Red Bull Flugtag is one of our favorites. Honestly, it’s the only one we can think of, but that doesn’t mean we’re any less enthusiastic about giving flight to half baked ideas. Today was the Portland round of the international event. Teams have to submit an application for their craft in advance. The vehicle can have a maximum wingspan of 30 feet and a weight with pilot of 450 pounds or less. Power is from muscle or simply gravity. The vehicle also has to be easily retreivable so they can get it out of the water. Judging isn’t just for distance, but for creativity, too. Flickr users [pdx-kate] and [Jabin] have uploaded images and video from the day: The winner was Team Yakima’s big wheel that flew 62 feet. Second place went to Greased Lightning at 55 feet. Third was the FreeBallin sneaker which you can see in flight here. The People’s Choice award went to the Space Balls Winnebago, which we unfortunately can’t find a very good picture of. You can read more about each individual entry on the results page. Embedded below is the video of the current US record holder: a banjo that went 155 feet in Nashville. The next US event will be September 6th in Chicago. The iphone-dev team hasn’t been resting on their laurels since releasing the iPhone Pwnage Tool 2.0 nearly two weeks ago and decided to update everyone on their progress. Despite the iPhone 2.0 jailbreak, there still isn’t a way to unlock a 3G phone. They’ve managed to do other things like downgrade a 3G to an older baseband firmware, which demonstrates their ability to bypass security checks and run unsigned code on the baseband. A nice side effect of all the downgrade work is that they’ve perfected the percautions they take to prevent bricking. The team has been following threads about using SIM proxy devices for unlocks as well, but concluded that the devices are a kludge at best and reliability can vary wildly depending on the phone’s location. They also pointed out the fine work that RiP Dev has been doing on Installer 4 which will help you install software that isn’t from the AppStore. The Arduino hardware clones keep rolling in. 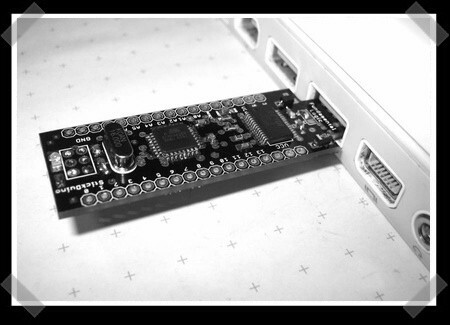 This weeks entry into the modern dev board’s roster is the StickDuino. The board is designed to be fully hardware compatible and plugs directly into your USB port. The StickDuino uses all SMD components. The creators know that this can make assembly more difficult so they’ve space the components out, opted for larger pads, and collected some links to SMD tutorials. The board feature two more analog inputs than the Diecimila and it has a jumper so you can switch it to 3.3V. All around it looks like a great product; frankly we love anything with full board layouts.